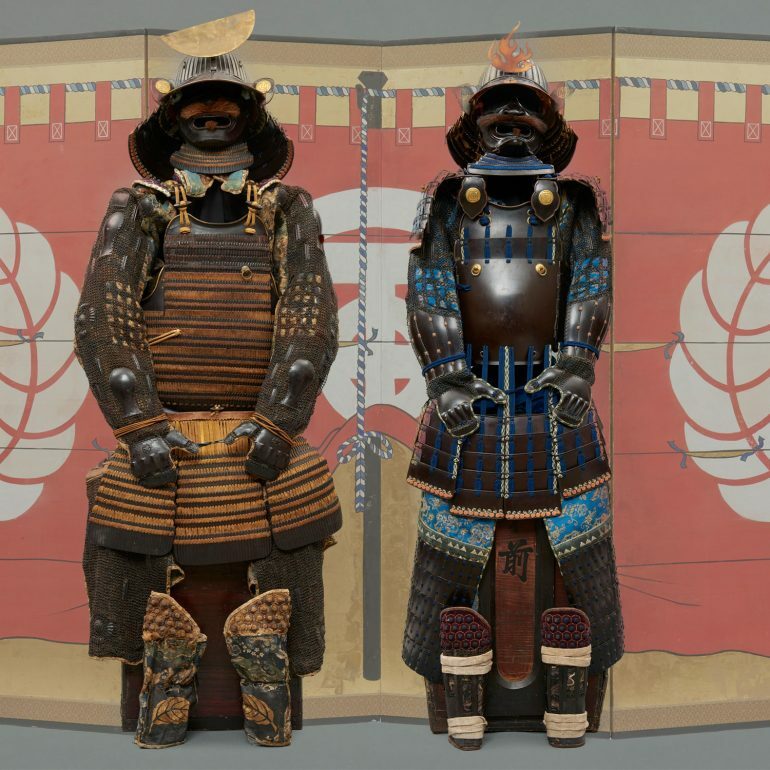 Important set of two suits-of-armour (yoroi), complete with two high six panel two suits-of-armour (yoroi), that belong together as is indicated by the used family crests (mon). The crests are the Nakagawa kurusu, a cross with a circle like a Celtic cross inside a circle. The cross was originally a Christian symbol but after the ban on Christianity in Japan the use of a hidden cross in family crests could continue. The other crest is the Nakagawa kashiwa: two leaves of the Japanese Emperor Oak turned to each other (dakikashiwa mon). Both crests belong to the Nakagawa family of Oka Castle. in the Harima Fief to Oka Castle in Kyūshū. 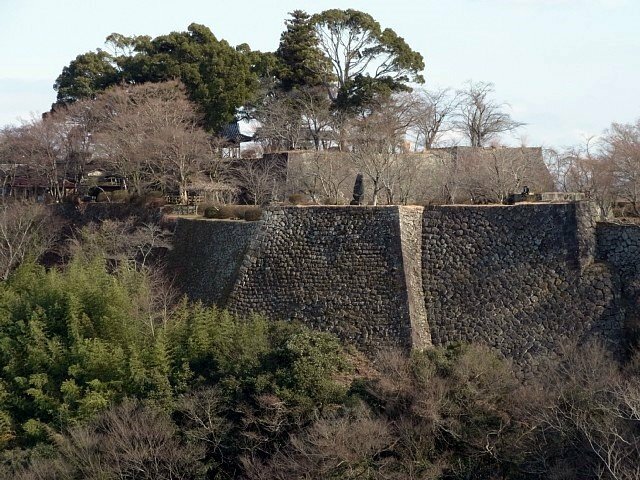 The Nakagawa family stayed in possession of Oka Castle till the abolishment of the military use of castles in 1873. 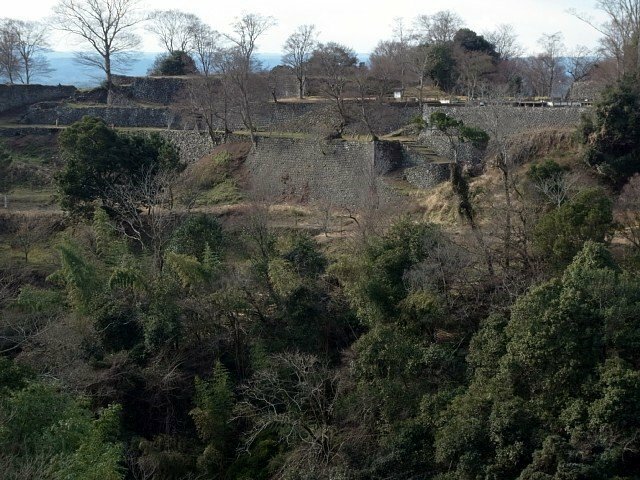 After the Nakagawa’s left the castle and the building soon dilapidated and is now known as Oka Castle Ruins. part of Taketa Town in Ōita Province on Kyūshū. 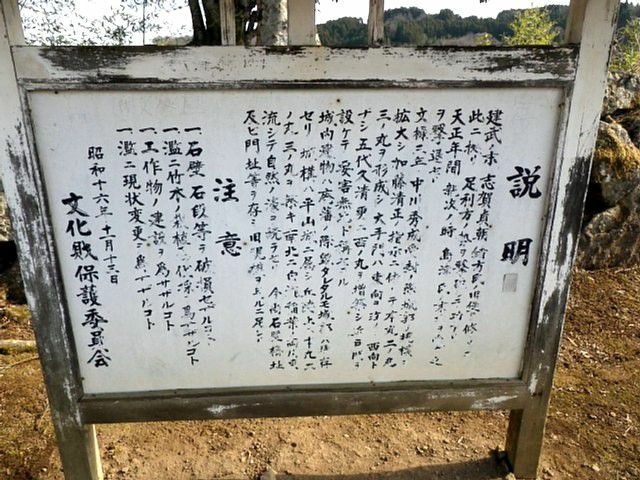 In 1884 the Nakagawa family received the title of Count (a title in use till the abolishment of aristocracy in 1947). 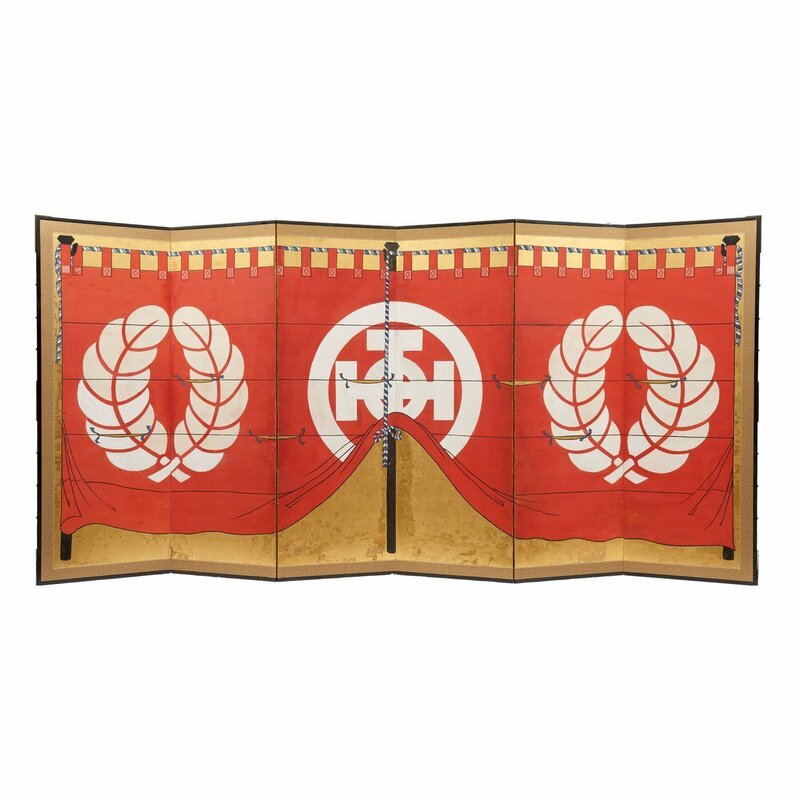 Set of two large byobu screens, painted with red curtains on gold leaf ground. 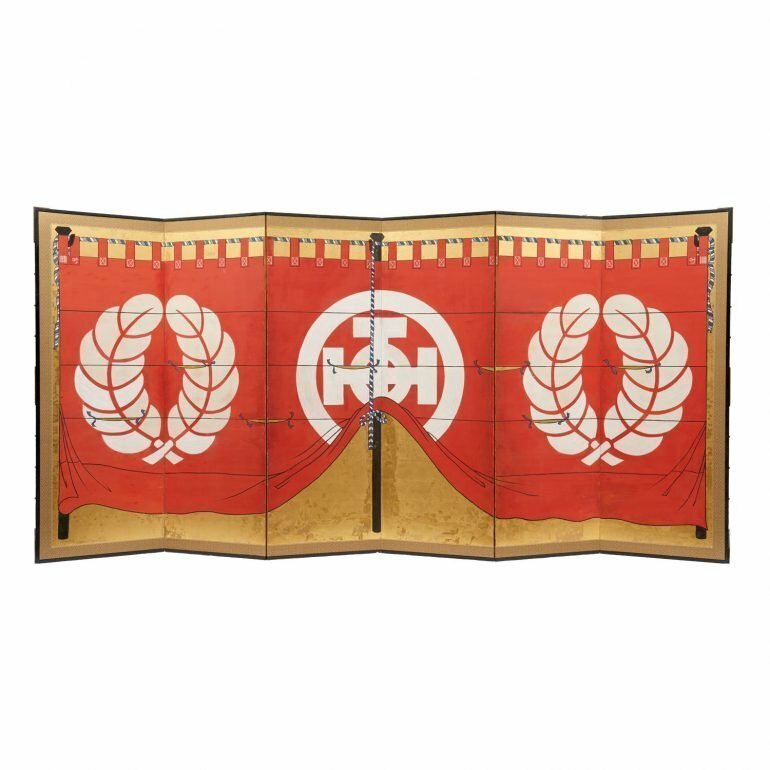 The curtains show the crests of the Nakagawa family: one screen has two Nakagawa-kurusu crests and one the Nakagawa-kashi crest, the other one Nakagawa-kashiwa crest and two Nakagawa-kurusu crests. Size; H. : 173,5 cm; W. : 62 cm (2x, 6x). 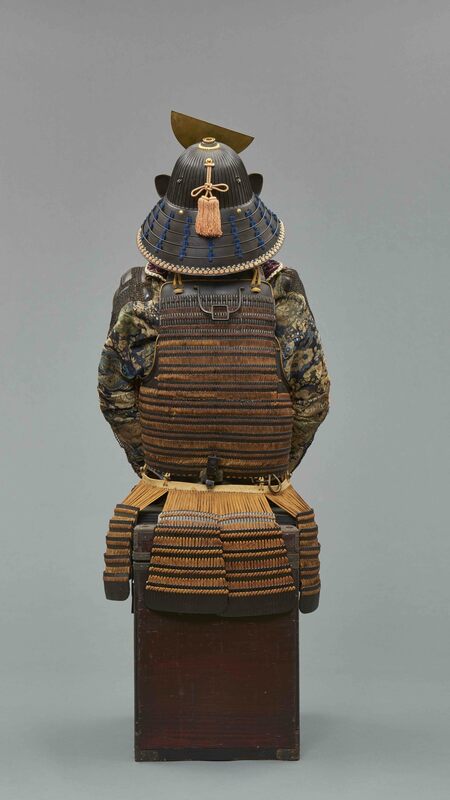 A black lacquered suit-of-armour (yoroi) with orange cords (kuro’urushinurihi’ito odoshi dōmaru). A thirty-two plate sujibachikabuto helmet with in front a maedate (with traces of gilding) in the shape of flames. 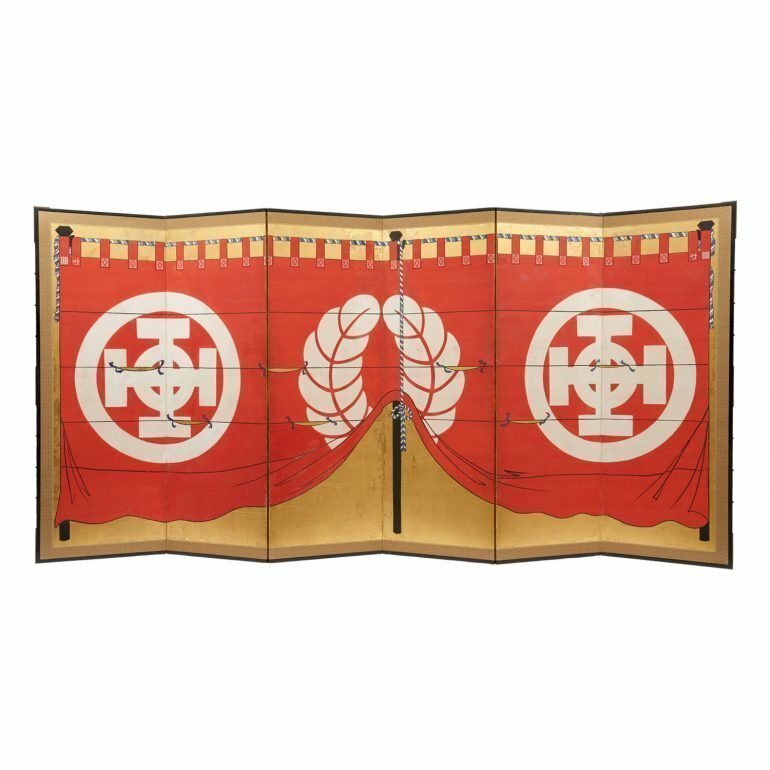 The fukikaeshi and the sunshade of the helmet have the Nakagawa-kashiwa crest in gold makie lacquer. Five neckguards (shikoro) have faded orange cords. The neck is covered with brocate. Together with a facial mask with a separate nose piece, brown mous-tache (resseibō) and a small four-piece gorget. 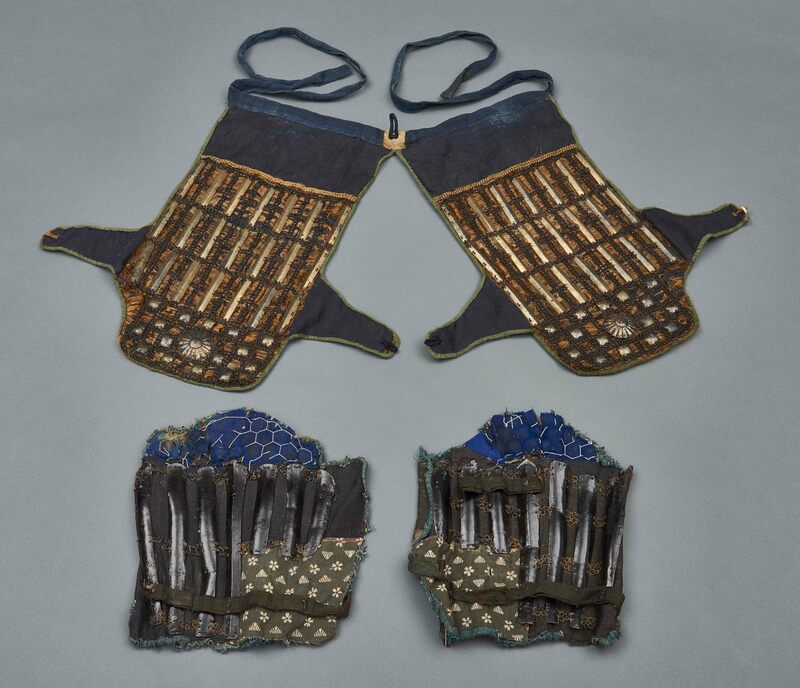 Tsubokote protect the arms withJapanese mail and a gourd shaped metal plate. A two-piece cuirass with faded orange cords with laced horizontal metal strips (itazanedō) from which hang seven five-piece kusazuri. Large haidate that have Japanese mail and vertical metal strips protect the upper legs. Brocate suneate that originally had vertical metal strips(shinosuneate) protect the lower legs. The suneate have leather parts decorated with oak leaves that together form the Nakagawa-kashiwa crest. 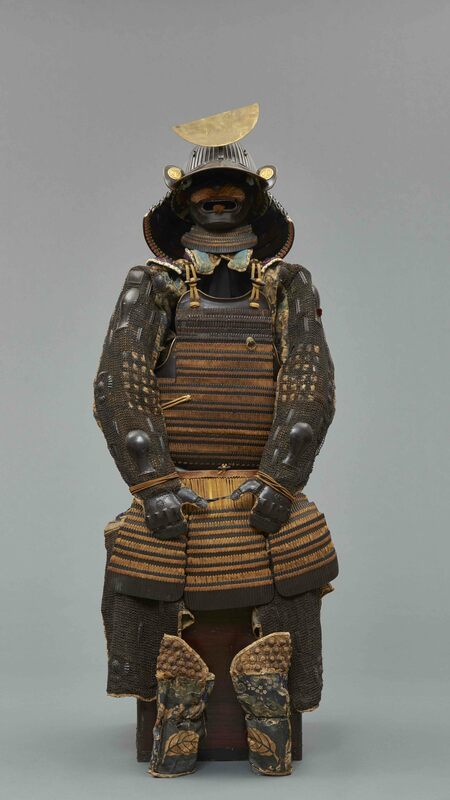 The suit-of-armour has a second set of haidate with gilded vertical metal strips and Japanese mail over brocate. In a box for a suit-of-armour (yoroibako). Late Edo period. 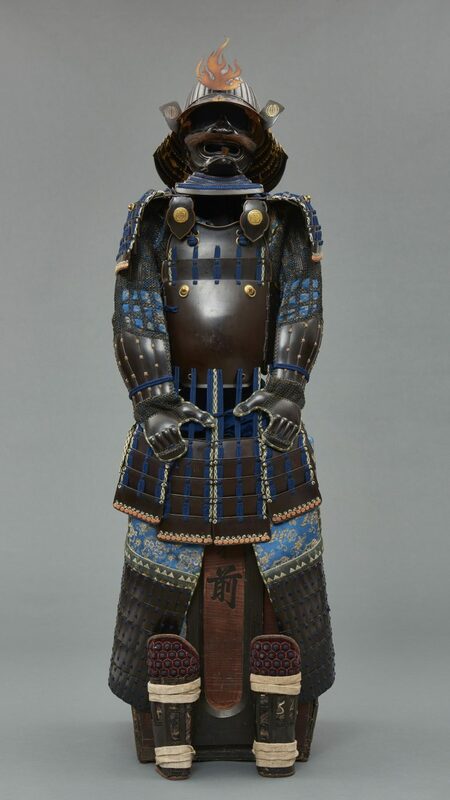 A complete black suit-of-armour (yoroi) with blue cords (kuro’urushinuri go-maidō gusoku). 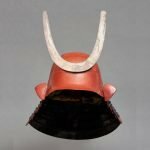 A sixty-two plate sujibachikabuto helmet with small fukikaeshi decorated with a gilded Nakagawa-kurusu crest in relief, an orange tassel at and in front a large brass half-moon maedate. Four neckguards (shikoro). 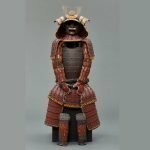 A grim looking old man’s face facial mask (resseibō) with ears and a very large brown moustache together with a four-piece gorget. Six-piece sode on the shoulders. 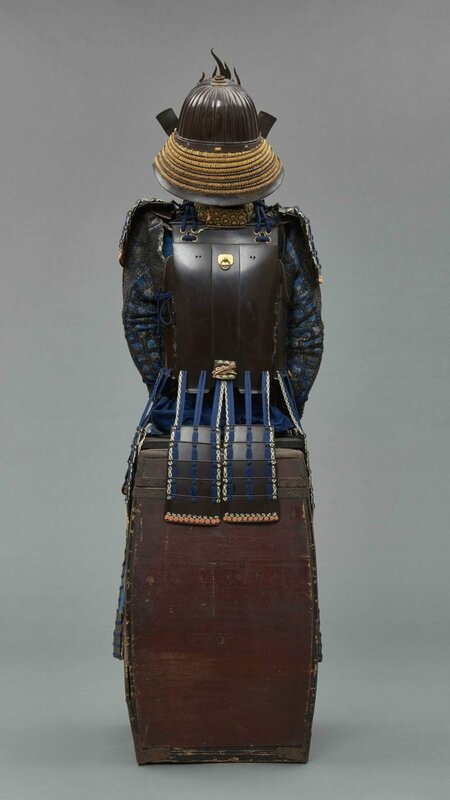 The kote that cover the arms have Japanese mail over blue brocate and below laced metal plates (dōkote). A five-part cuirass with a frontal plate(gomaidō). In front and at the back rings for tassels. The so called apricot leaves(gyōyō) that hang in front at both sides of the neck, have a relief with the Nakaga-wa-kurusu crest. 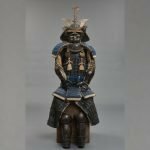 From the cuirass hang eight five-piece kusazuri. The large haidate show above blue brocate and is below completely covered by laced karuta metal plates. Shinosuneate with vertical metal strips protect the lower legs. In a box with bulging sides for a suit-of-armour (yoroibako). Edo Period.